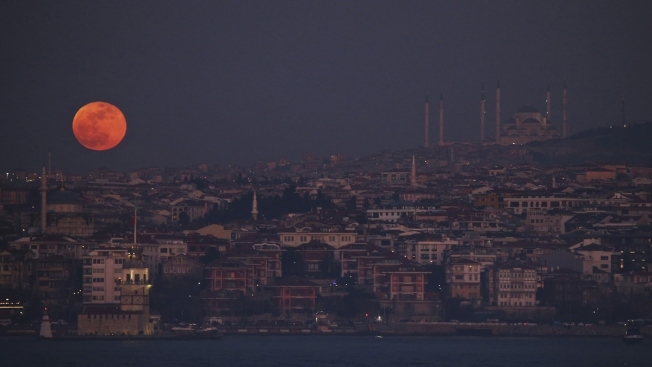 In this Jan. 31, 2018, file photo, the moon is seen rising over the Bosporus Strait separating Europe and Asia in Istanbul during an eclipse. This week will bring the longest total lunar eclipse of the 21st century, one that will turn the moon red in the night sky, NBC News' Mach reports. The Earth's shadow will fully engulf the moon for 1 hour and 43 minutes on Friday, though the spectacular space show won't be visible in North America, just parts of South America, eastern Africa, the Middle East and central Asia. "This is a really cool eclipse," NASA planetary geologist Noah Petro said. The length of the eclipse is due to the moon moving right down the middle of the Earth's shadow.